This Breakfast Burrito is my go-to for a filling, savory breakfast that’s easy to make. 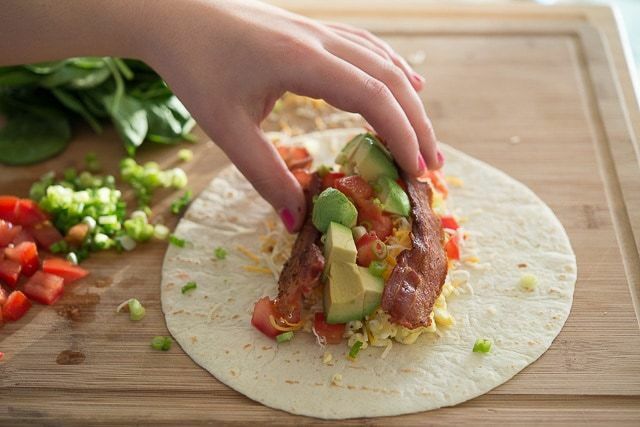 Warm tortillas are filled with scrambled eggs, cheese, avocado, bacon, and more. I didn’t understand all the hype around breakfast burritos until my friend made some for me. DANG it was good. It doesn’t seem like it could possibly be all that special, but it really is satisfying like you wouldn’t believe. There’s something about the way all the ingredients are wrapped up together into the perfect bite, and you can put so many different combinations of ingredients in there. What’s nice is you can also make a burrito just for yourself, or to feed a crowd. All the ingredients scale well, and you can also wrap them up in paper or foil and take them on the go! 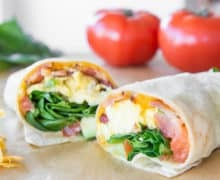 The breakfast burrito I’m sharing today has scrambled eggs, bacon, cheese, tomatoes, avocado, spinach, and scallions, all wrapped up in a warm tortilla. But there are so many other ingredients you can put there in too, like breakfast sausage, chorizo, ham, salsa, hash browns or potatoes, black beans, onions, peppers, and more. If you want to make big batches of bacon for lots of burritos, here’s a post on How to Cook Bacon in the Oven. Make sure you’re using good quality bacon, like Niman Ranch, Nature’s Rancher, or Wellshire Farms. I am amazed by how much the quality of bacon ranges, and it makes such a difference here! The crispy bacon and some avocado…. Sometimes if I have leftovers from this pork Carnitas Recipe, I’ll swap that in for the bacon. (Yes, I have a problem with overstuffing things). Some of my other favorite savory breakfast recipes are this Potato Cheddar Frittata, Bacon Cheddar Waffles, and Herbed Baked Eggs. Enjoy! 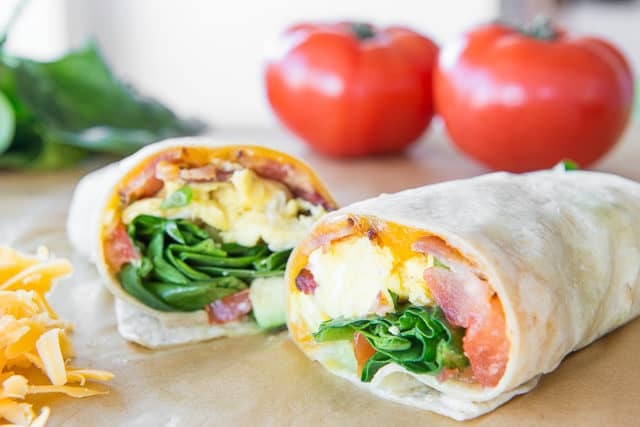 Can breakfast burritos be frozen? Yes, but it depends on what’s in them. You want to fill them with freezer-friendly ingredients, like eggs, meats, cheese, potatoes, and some cooked veggies like peppers would be fine too. But fresh spinach, tomatoes, avocado, etc shouldn’t be frozen. How to reheat breakfast burritos: The best method is to put them in a skillet with a lid and warm them up in the pan until golden on the edges and warm in the middle. You can use the microwave, but they’ll be soggy. 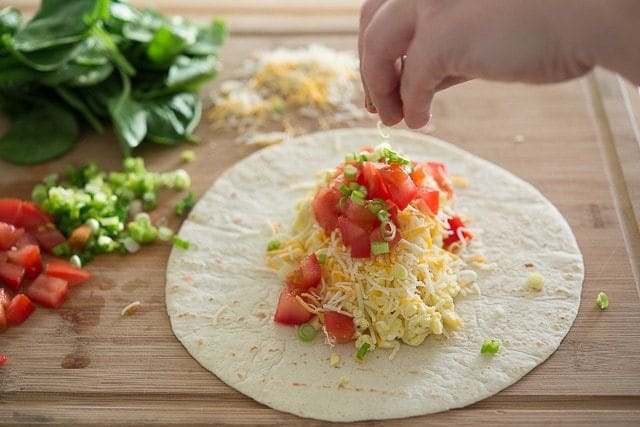 These Breakfast Burritos are perfect for a filling, savory breakfast. 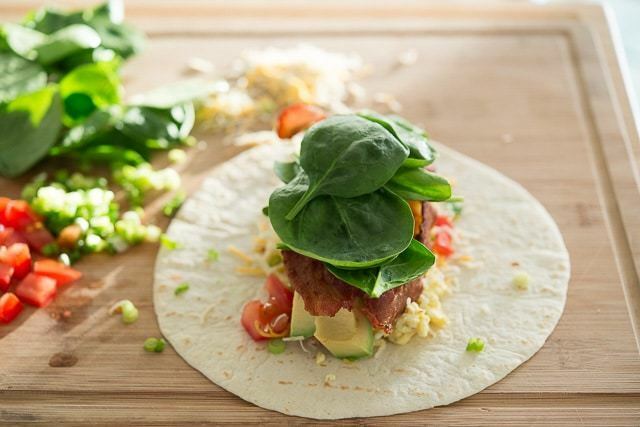 Warm tortillas are filled with scrambled eggs, avocado, cheese, bacon, tomatoes, spinach, and scallions. Cook the bacon in a medium skillet until crisp (or see How to Cook Bacon in the Oven). 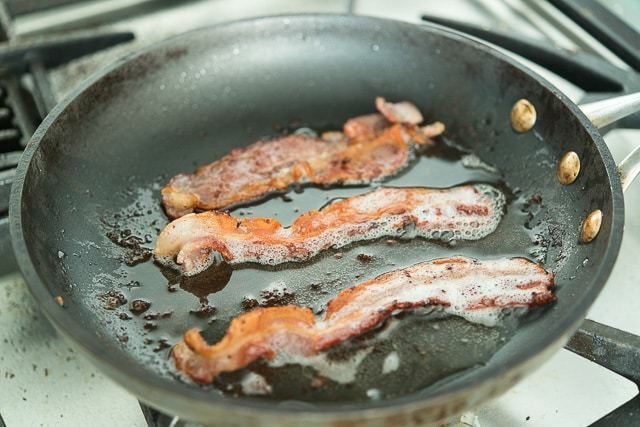 Remove bacon from pan and drain on a paper towel lined plate. Pour off excess fat from the pan and wipe clean with a paper towel. 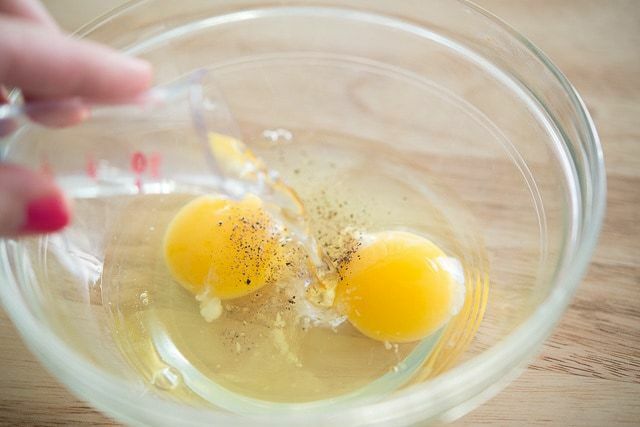 You can use the same pan to cook the eggs. 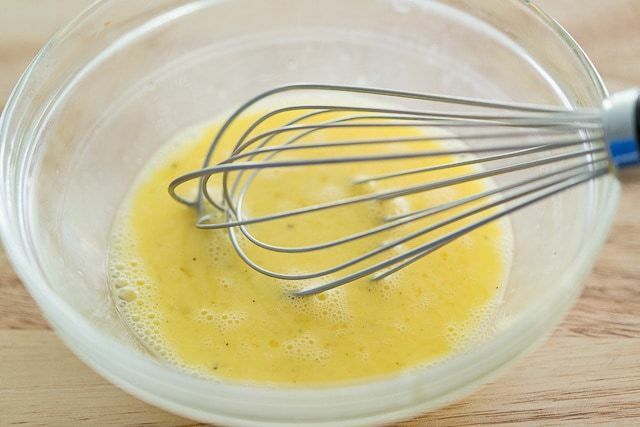 In a small bowl whisk the eggs with 1 tablespoon of water. Season with a pinch of salt and pepper. Place the skillet over medium high heat, add the eggs and scramble them. This should only take a couple minutes. Meanwhile, microwave the tortilla for about 15 seconds until it is pliable. To assemble, spoon the eggs on to the tortilla. Top with cheese, bacon, avocado, spinach, tomato, and scallions. 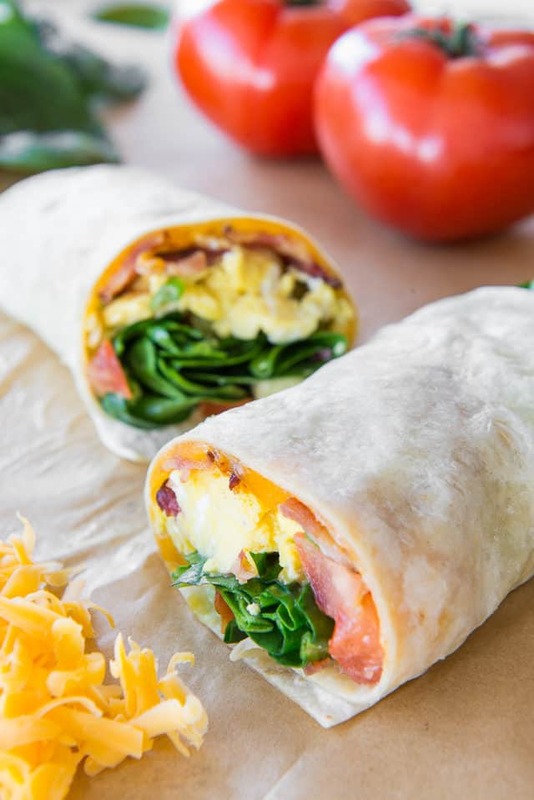 Roll up the tortilla and the breakfast burrito is ready to enjoy! Post updated in August 2018 with updated photos, writing, and more tips. Originally published February 2016. I need to make this for breakfast in the morning! My new favorite for breakfast! As a Gringo, who married into a Mexican family, I’ll add that a tortilla preheated on a flame, not a pan, makes for such a nice flavor enhancement. I live in the hills of Silicon Valley with no gas service. When I replaced the electric stove I chose a Propane stove option and swap BBQ tanks as needed. Just because tortillas taste so good flamed.